Right from the start, filmmaker Jason Zada begins filling scenes in this horror movie with insinuating elements involving eerie noises, deep shadows and sudden jolts. And it succeeds in freaking the audience out entertainingly. Then Zada seems to get tired of sustaining the psychological terror, letting the final act become swamped by a flood of gimmicky cliches. The story centres on Sara (Natalie Dormer), a young woman suffering from unnerving nightmares about her identical twin Jess (also Dormer), who was last seen entering Japan's notorious Aokigahara Forest, the "sea of trees" where people traditionally go to commit suicide. So Sara leaves her husband (Eoin Macken) at home in America and heads to the foot of Mt Fuji to get some answers, ignoring warnings about angry spirits and impending doom. There she meets friendly journalist Aidan (Taylor Kinney), who wants to tag along and write a story about her. But once they enter the forest, their phones and compasses stop working, then even creepier things start happening in the gloomy darkness. The director gleefully piles on suggestive imagery, hinting at all kinds of things that might be going on here. Sara and Jess are like opposite sides of a coin: blonde and sensible versus brunette and free-spirited. And they have a tragic back-story that reveals itself in a series of dreamy flashbacks. Cleverly, their childhood snapshots make them resemble the sinister twins from The Shining. So Sara's continuous premonitions add layers of uncertainty, especially as she indulges in illicit flirtation with the handsome Aidan. Dormer is solid in the central role, nicely balancing Sara's scepticism with a haunting sense of dread. And Kinney is terrific as the helpful stranger who seems too nice to be trusted. Meanwhile, the forest itself makes the entire film feel like a fairy tale that's threatening to turn seriously nasty at any moment. Comic book star Constantine will not be bisexual, as depicted in the graphic novels. Plenty of comic book fans have been left baffled after discovering that the character Constantine in NBC's upcoming adaptation of the same name will not be portrayed as bisexual, contrary to his graphic novel depiction. It has been simultaneously revealed, however, that the DC Comics character will be shown to be a smoker, true to the original stories. At the TCA press tour on Sunday, the network attempted to play down the decision. "In those comic books, John Constantine aged in real time," executive producer Daniel Cerone said, via Variety. "Within this tome of three decades [of comics] there might have been one or two issues where he's seen getting out of bed with a man. So [maybe] 20 years from now? But there are no immediate plans," he added. With regards to Constantine's smoking, executive producer David S. Goyer said "He is a smoker in the show, we're not shying away from it, but we're not glorifying it." NBC Gets Dark With "Constantine Series Order"
The series is definitely one to look out for this fall. For some people May means summer break and hitting the beach, for others – network upfronts. This week, the fate of your fall television schedule is being decided with a constant stream of series pick-ups, put-downs, renewals and cancellations. One notable series order among them is NBC’s pickup of Constantine, a dark comedic thriller (sounds exciting already, right? ), adapted from DC Comics’ Hellblazer, created in part by Alan Moore, Steve Bissette and Jamie Delano. Along with the CW picking up The Flash, this makes two DC comics to hit the small screen this fall, CinemaBlend reports. Continue reading: NBC Gets Dark With "Constantine Series Order"
Batman Vs. Superman Possible Titles Registered By Warner Bros: Which Sounds Best? Warner Bros. register a list of possible titles for the 2015 action movie. Warner Brothers have sparked off plenty of excitement after registering several possible titles for the Man of Steel sequel this week, through the internet brand protection company MarkMonitor, reports Fusible. Currently referred to as Batman Vs. Superman, the movie will see Henry Cavill's Superman go head-to-head with Ben Affleck's Batman. 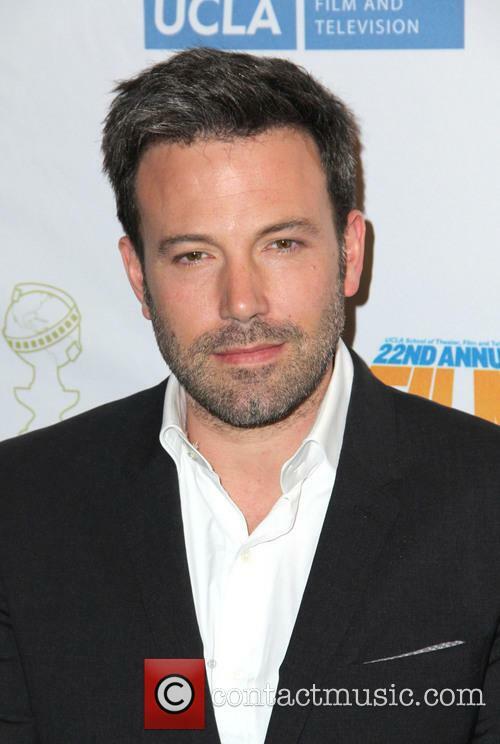 Ben Affleck Will Become The Next Batman. 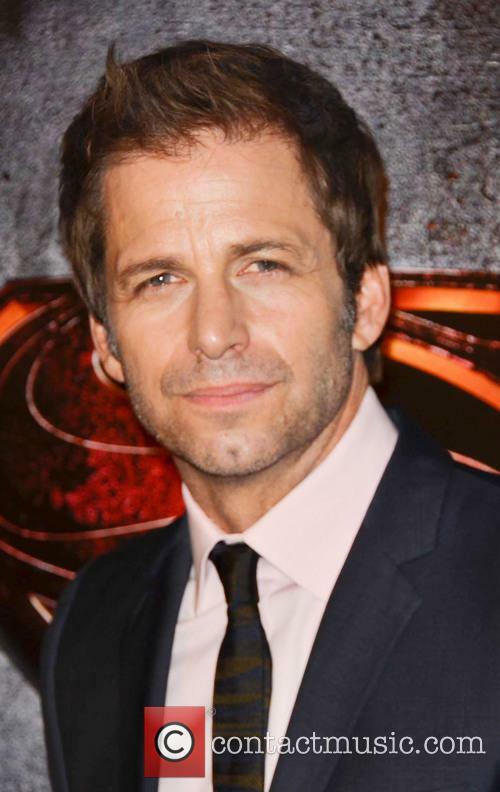 The Zack Snyder-directed sequel is set to premiere in 2015 but the filmmakers are ensuring that there's sizeable fan interest in the project way, way before the movie is released. During August's Comic-Con panel, Man of Steel actor Harry Lennix read from Frank Miller's graphic novel from a scene in which the caped heroes are locked in battle to set the scene for the new movie: "I want you to remember, Clark. In all the years to come, in all your most private moments, I want you to remember my hand at your throat. I want you to remember the one man who beat you" to which the Superman and Batman logos were projected on to a screen melded together. Continue reading: Batman Vs. Superman Possible Titles Registered By Warner Bros: Which Sounds Best? Contrary to reports that Ryan Gosling was favoured to take over from Christian Bale as Batman, Teen Wolf's Tyler Hoechlin will reportedly screen test alongside Henry Cavill. Zack Snyder announced at last weekend's Comic-Con that the Man of Steel sequel would also include Batman as DC Comics edged closer to its Avengers equivalent: the Justice League of America. Stunned fans were treated to a reading from Frank Miller's The Dark Knight Returns comic book - in which Batman and Superman clash - followed by a projected teaser image that combined the superheroes' logos. 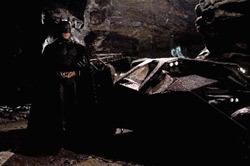 Shortly afterwards, writer David S. Goyer revealed that the production team were mulling over names such as Superman vs. Batman or Batman vs. Superman after a similarly titled project failed to get the green light back in 2002, Yahoo! News reports. However, the focus has shifted to who would replace the gravel-voiced Christian Bale as Batman. Could Teen Wolf Tyler Hoechlin Evolve Into Batman? Cosmic Book News claims to have been told that "Regarding the new Batman, Tyler Hoechlin is being heavily considered for the part and will be getting a screen test alongside Henry Cavill. 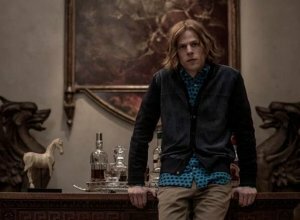 Warner Bros. and Snyder are looking at somebody to play the new Batman with a reputation similar to Cavill's, when Cavill was testing for Superman. It's also said that better known actors could also be testing for the role. 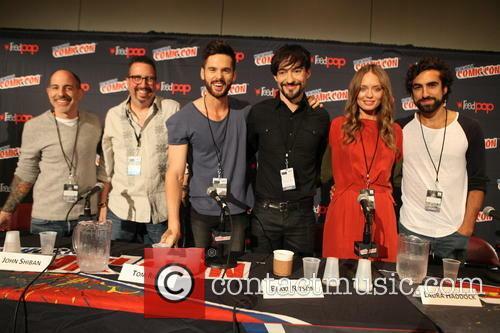 As filming is expected to begin in early 2014, screen tests should be happening soon." Is 'Batman Vs. Superman' The Title Of New DC Comics Movie? 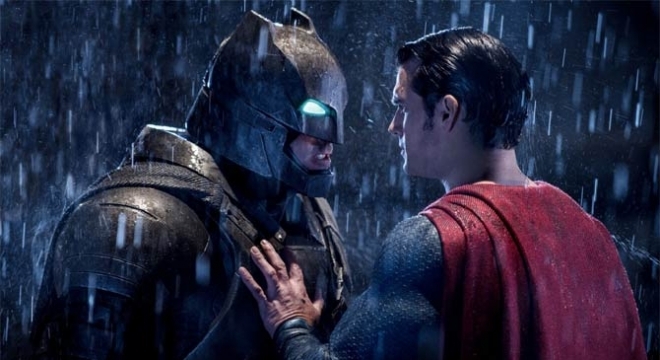 After Zack Snyder's Comic-Con announcement that Batman and Superman would meet on screen for the first time in a 2015 Warner Bros. movie and sequel to 2013's Man of Steel, there's now fresh knowledge from screenwriter David S. Goyer that the production team are mulling over a few specific titles. 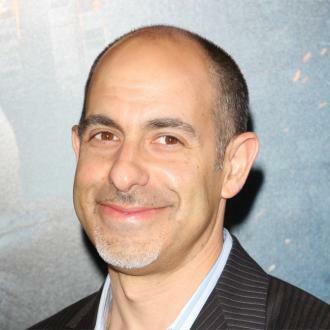 "We're already in pre-production," Goyer told a Comic-Con panel on Sunday. "(The film) comes out in summer of 2015 ... We're actually not sure whether the title is 'Superman vs. Batman' or 'Batman vs. Superman,' but yes, it's that rematch, that combination, the two guys onscreen and that's happening," as reported by the NY Daily News. The franchise will apparently eventually build up to match Marvel's Avengers movies with DC Comics' Justice League of America team that should also include Wonder Woman, Flash and Aquaman. Zack Snyder Teases Fans With New Movie Concept. Superman vs. Batman/Batman vs. Superman certainly gets the point across well: two opposing forces fighting it out. But to juxtapose the two characters in such a way seems a bit blunt; not least the question of superiority to whichever superhero's name comes first in the title. Secondly, the 'vs.' part implies the combatants represent antithetical concepts: good vs. evil, light vs. dark, heroes vs. villains, etc. Continue reading: Is 'Batman Vs. Superman' The Title Of New DC Comics Movie? Superman gets the Dark Knight treatment, as Christopher Nolan offers a much grittier, more intensely personal look at the biggest superhero of them all. It's a flawed film that feels far too violent for its own good, but the pungent story holds us in its grip all the way through, cleverly weaving the character's back-story into a series of emotive flashbacks along with massively thrilling action sequences. And along the way there are resonant ethical dilemmas, family issues and pointed political drama. Some 30 years ago, scientist Jor-El (Crowe) packed his infant son Kal-El into a pod and sent him to Earth to escape certain doom as the planet Krypton imploded after centuries of ecological abuse. This enrages the viciously tenacious General Zod (Shannon) who spends three decades searching for the child. 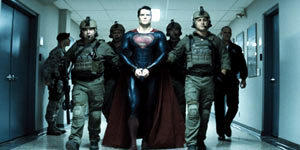 Meanwhile, Kal-El (Cavill) was raised as Clark in Smallville, Kansas, by the Kents (Lane and Costner), who taught him to keep his powers in check. 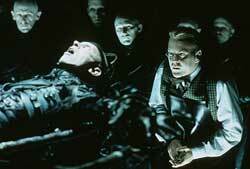 But when he activates a downed Kryptonian ship, he alerts Zod to his whereabouts. And just as nosey journalist Lois Lane (Adams) learns Clark's secret, Zod arrives to launch a full-on attack. This is a film about internal conflicts, and everyone has to face up to their own desires and responsibilities. Even Zod, whose dedication to his people means that he is willing to wipe out humanity in order to recreate Krypton on Earth. So Kal-El is caught between protecting his adopted planet and being loyal to his birth species. Lois is struggling with keeping a big secret or reporting the news. 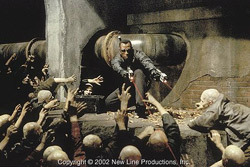 All of this provides plenty of gristle for the actors to chew on, even if the dilemmas aren't actually that difficult. And even though they sometimes seem consumed by the elaborate sets and costumes.